Discover how our full service, marine surveying company helps your ship and cargo reach their destination intact. At Anderson Marine Consulting, we use a variety of methods to keep track of the quantity of your freight, as well as the condition of your payload. When quantity or quality is in question, our assessments provide the exact answers you need. Ensure smooth, safe transportation of goods. 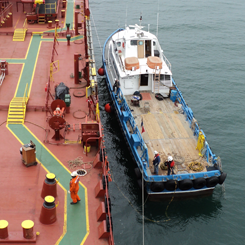 For more than 30 years, Anderson Marine Consulting has been helping shipping companies, ship owners, ship operators, and charter captains keep precise records of their vessels and the shipments they haul. We are one of the most established cargo consulting firms in the Corpus Christi, Texas area. Our team has an extensive history of providing shipping companies with accurate reports that are used in insurance claims, bookkeeping, and litigation. When you are shipping to or from the Gulf Coast, we make sure your freight departs and arrives safely and intact. Our economy and market thrive because of our ability to safely transport merchandise overseas. Crews and ships like yours make importing and exporting possible, and we are here to help make your job easier.